Since 2013, Argane Aouzac, in partnership with the Tazghlilite association for development, pays the water consumption bills of the crushers in the village of Taghzlilite to prevent them from fetching water at the well, Physical and difficult exercice. 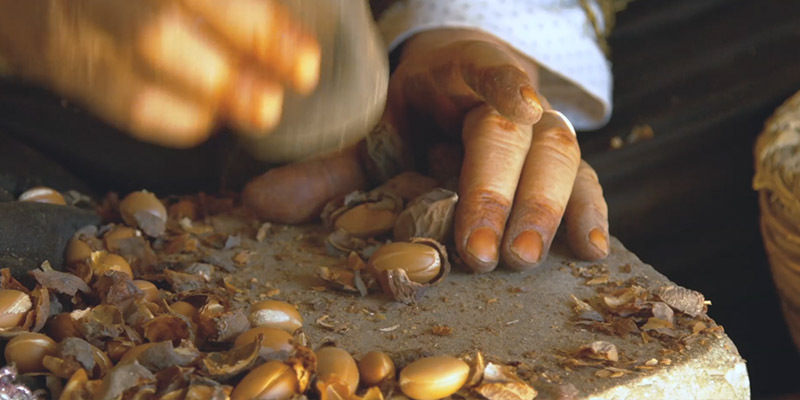 When women crush the fruit of argan, they extract the kernel which will be used to produce argan oil. There remains after crushing the pulp and shells. We give them the pulp to feed their animals, and the shell which is a very good propellant, allowing them to avoid cutting the argan trees to heat themselves, thus helping to preserve the argan forest. 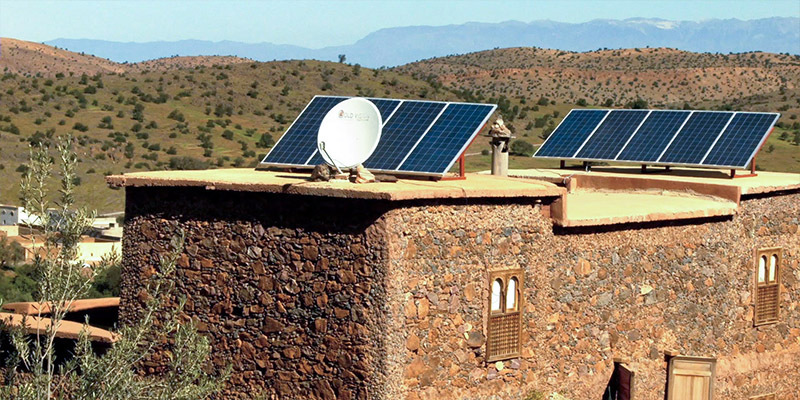 Argane Aouzac is very concerned with the protection of the environment and renewable energies. In 2013, we invested in the acquisition of nine solar panels and of the corresponding battery system to supply electricity to our factory. In 2017, Argane financed on it development fund all the necessary equipment for the opening of a literacy class for women in the village of a goh (blackboard, tables and chairs). The company also remunerates one of the girls of the village for the courses. 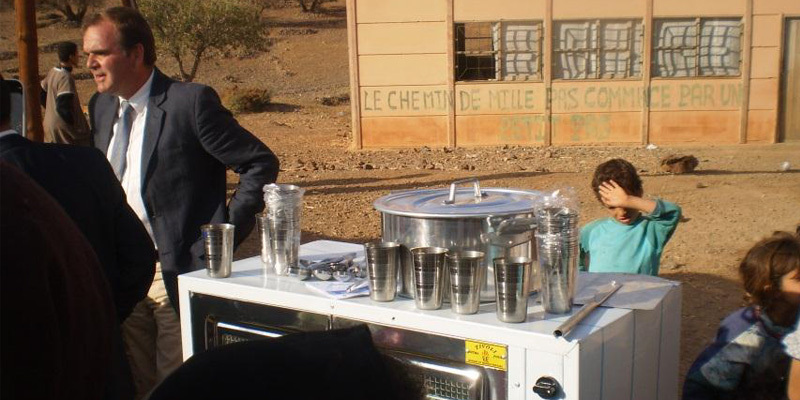 In 2009, Argane Aouzac has provided all kitchen equipments for the canteen of the Tazghlilite school (Oven, kitchen utensils…). This action was realized thanks to our development fund. All children attending school in the village can benefit. 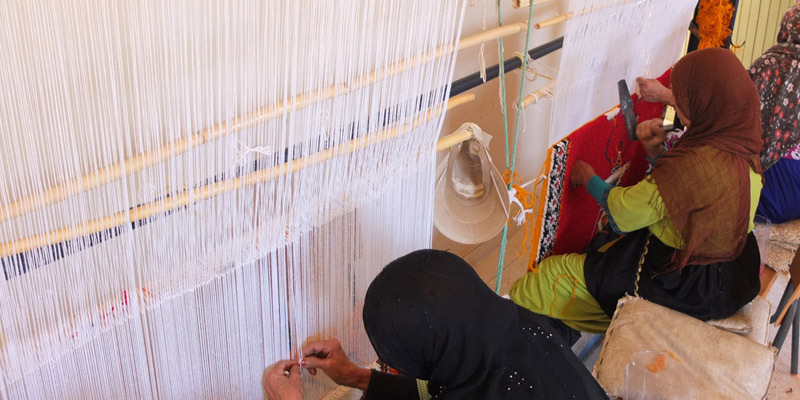 In collaboration with the association Tazghlilite for the development, Argane aouzac financed on its development fund the equipment of the female home in weaving material and remunerates the trainer. This allows women to acquire new skills and an economic activity complementary to the crushing of argan. In the anti-atlas mountains, especially in Tazghlilite (1200 meters of alt.) winter can be very cold. 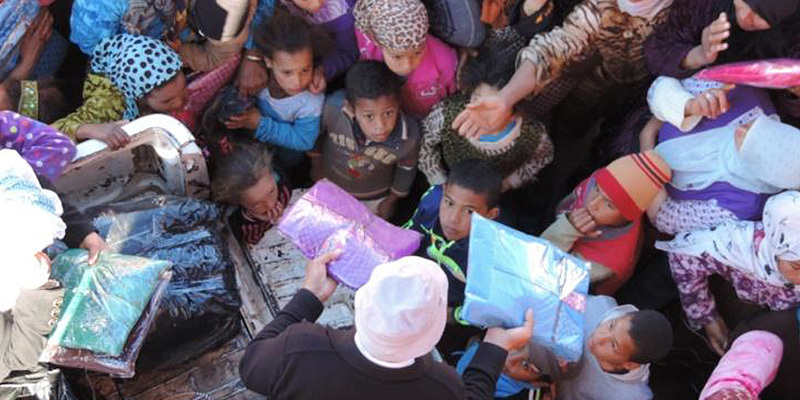 Each year, we organized a distribution of warm clothing for children and women. We financed a part of the operation with our developement funds. 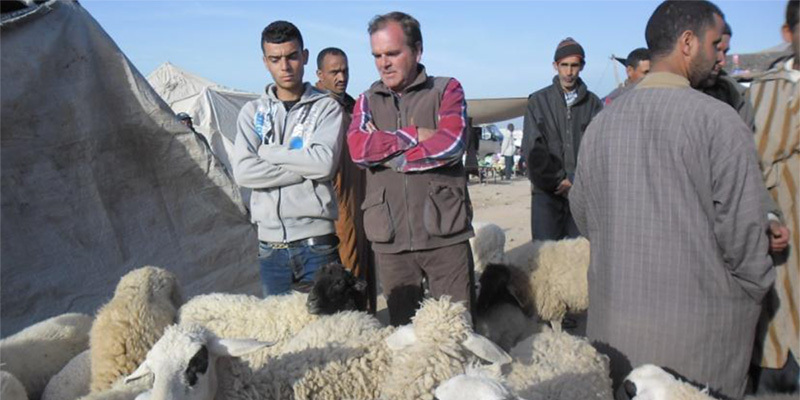 Since 2014, we have the support of a NGO that collect clothes in Europe and transport them to Morocco. More than 200 children and women benefited from this action. After the heavy floods of November 2014, the village of Arg, whose only access road passes through Tazghlilite, was landlocked. 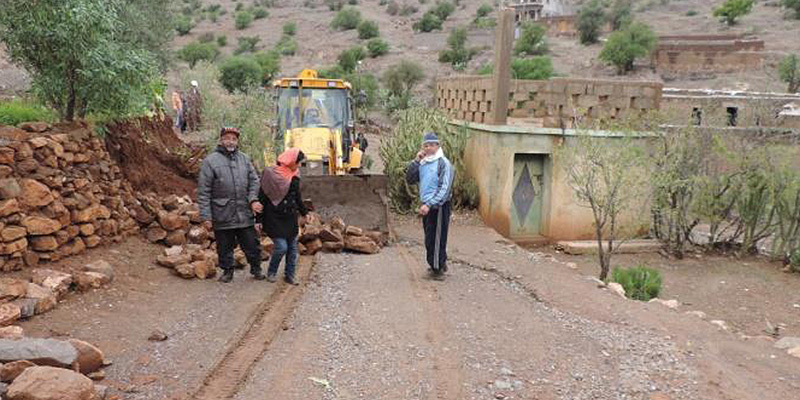 In emergency, Argane aouzac mobilized its development fund to finance the repair of the road and allow access to the village of Arg. 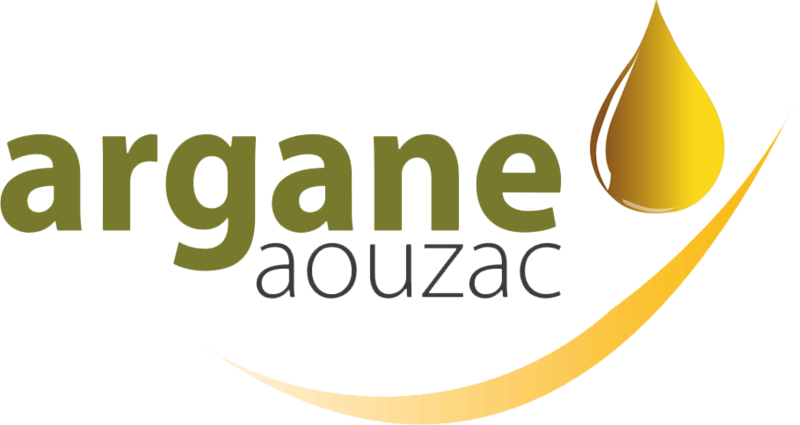 Each year since 2011, Argane Aouzac spends part of its development fund for a buying action of ewe which are given out to women of villages. That allow women to have their own ewe : they can have them breed to have sheep for following years, and that allow them to have milk for children and some wool for weaving rugs.